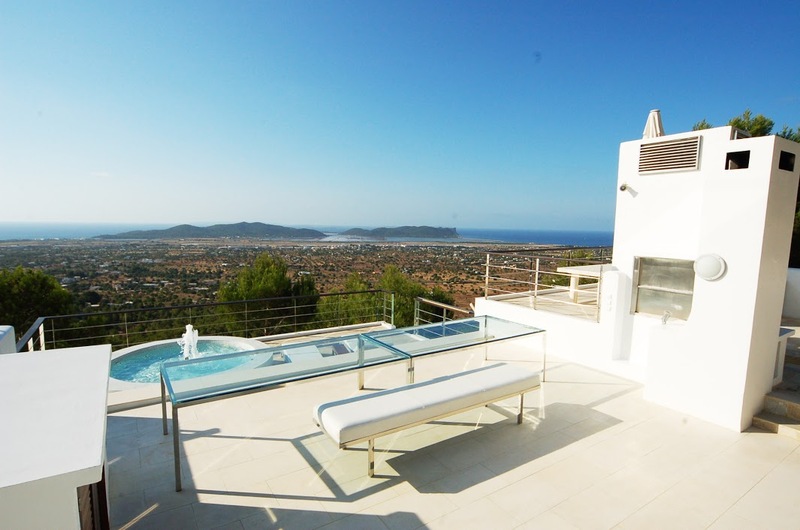 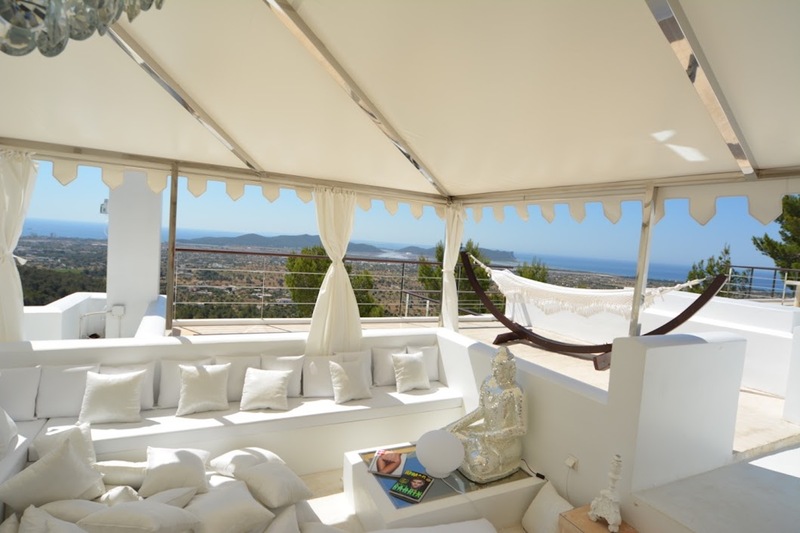 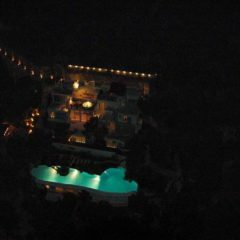 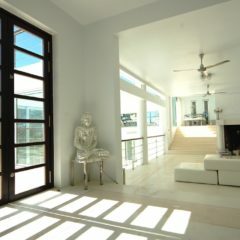 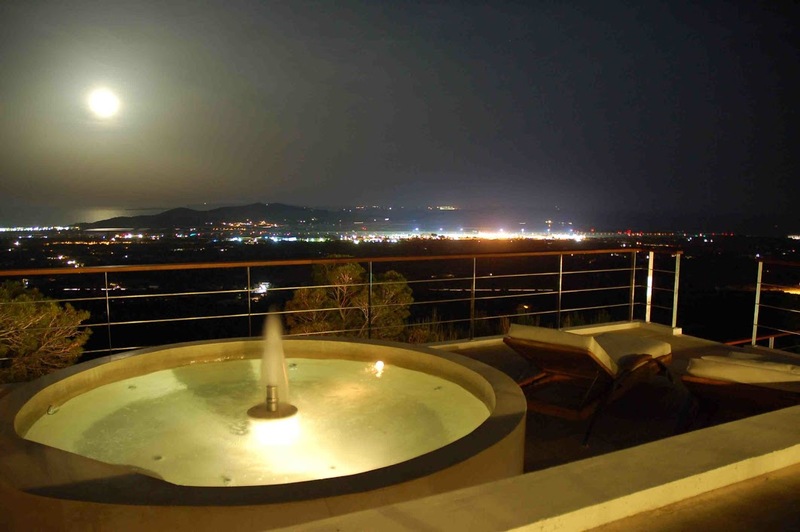 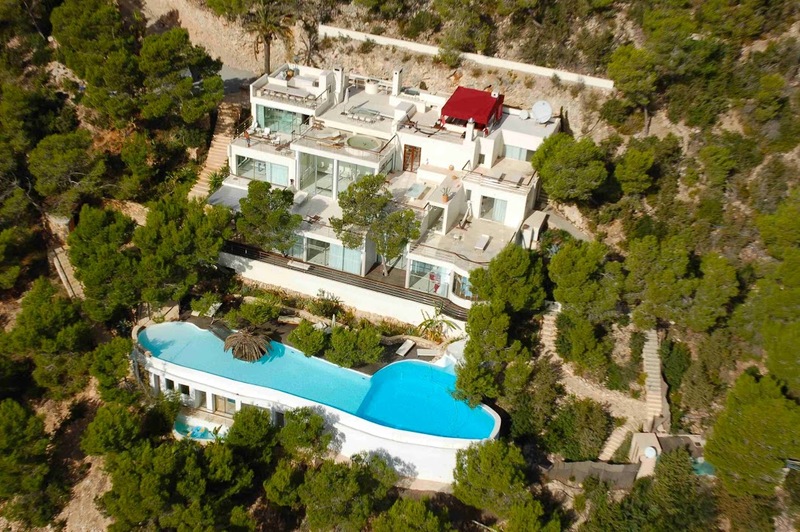 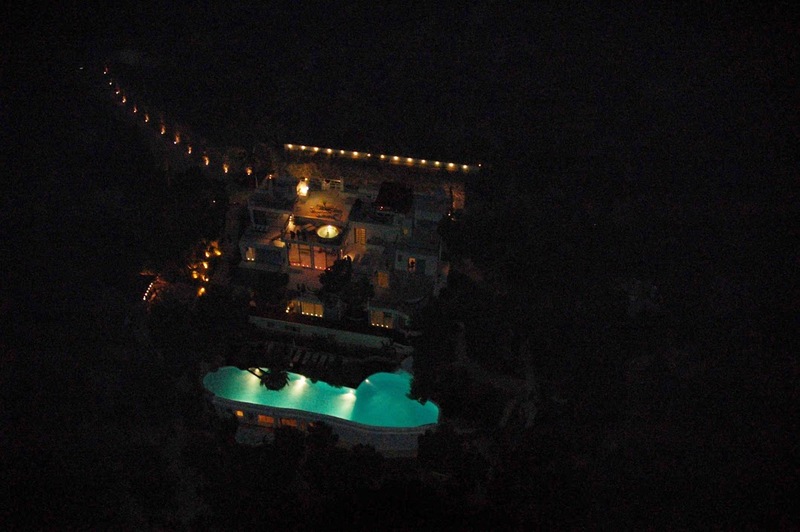 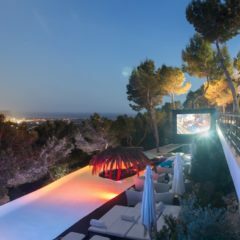 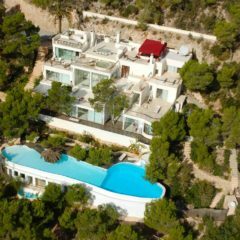 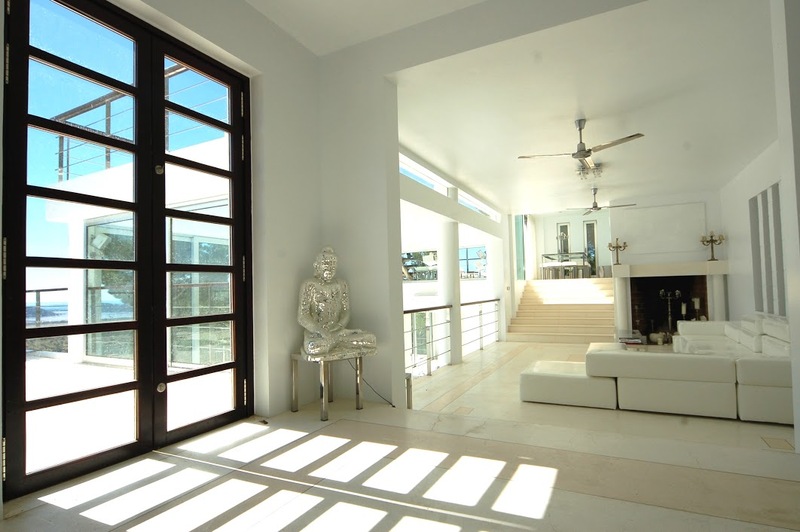 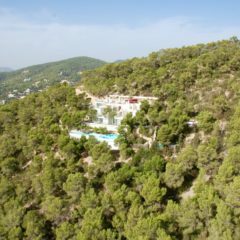 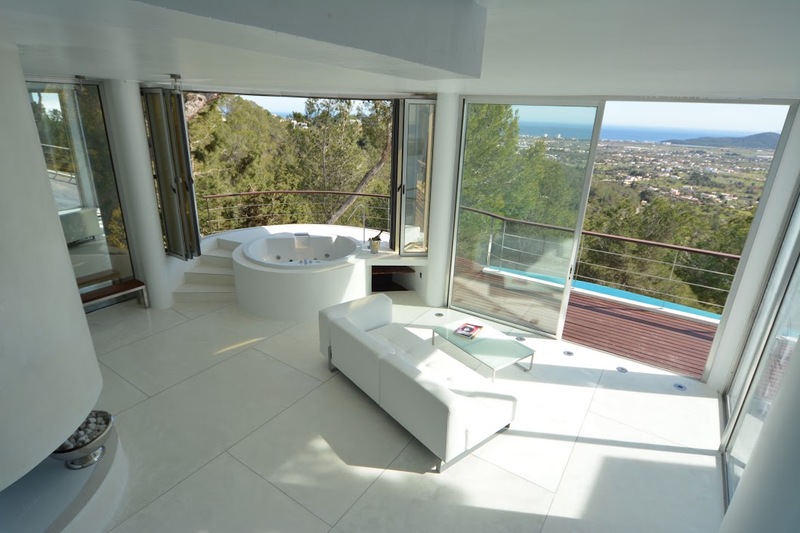 The breathtaking Villa Top of the World is one of the most exciting buildings in Ibiza. 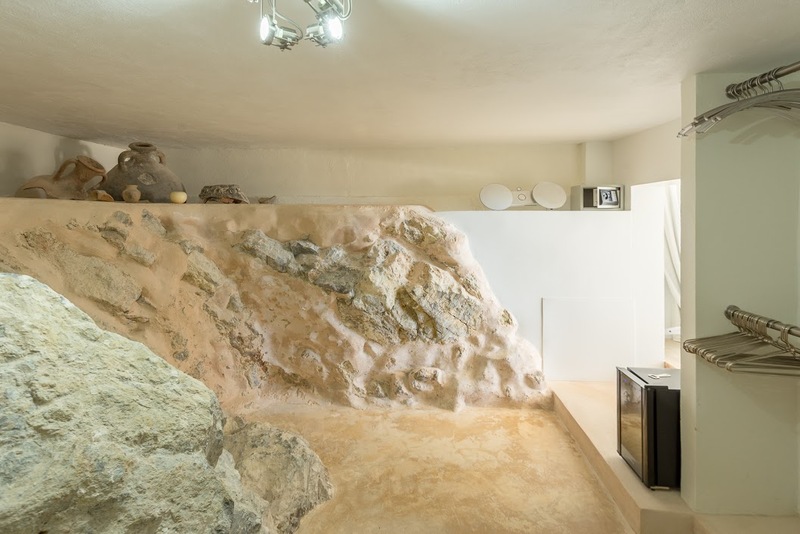 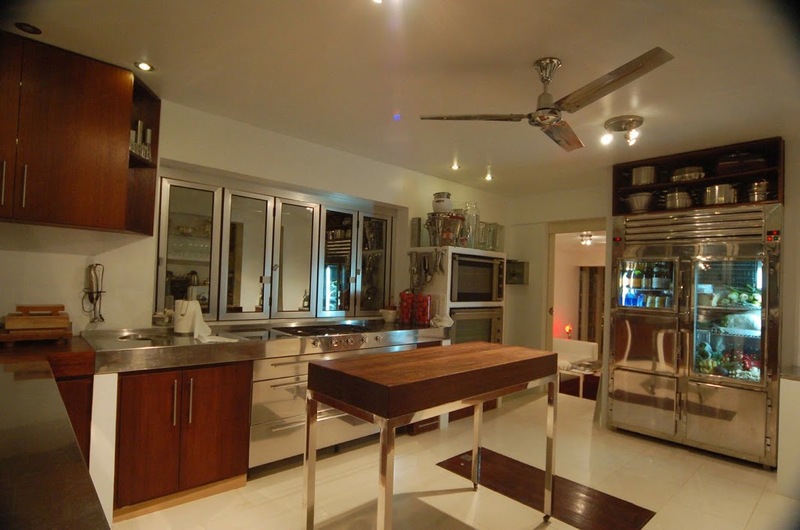 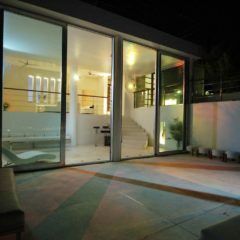 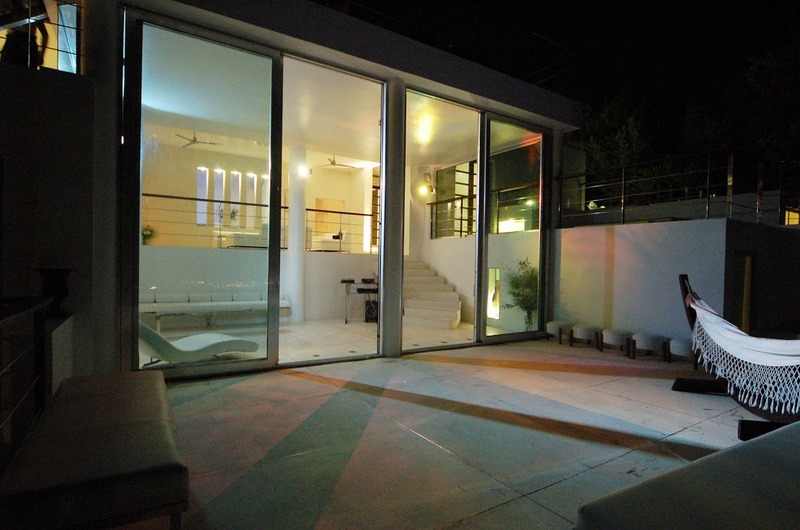 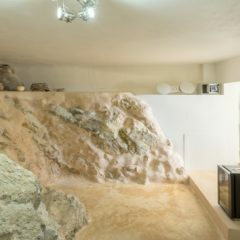 It is a highly modern house for a maximum of 12 guests. 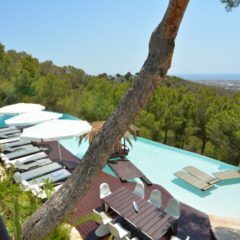 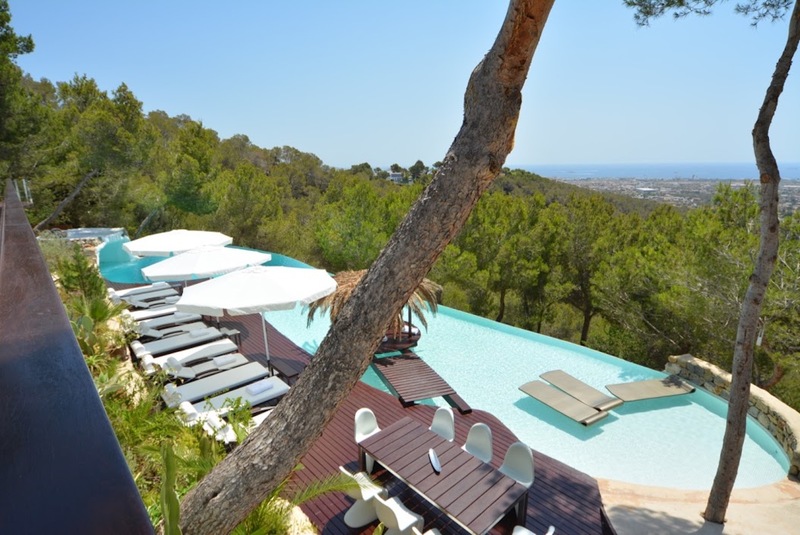 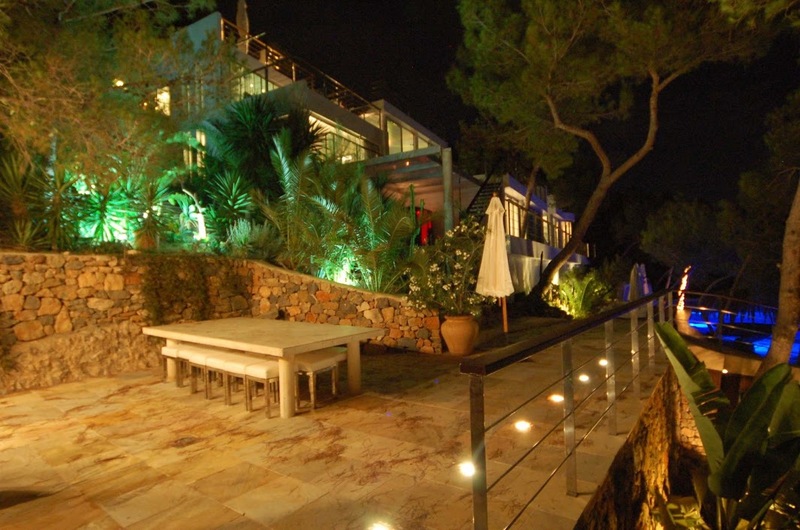 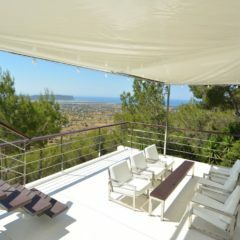 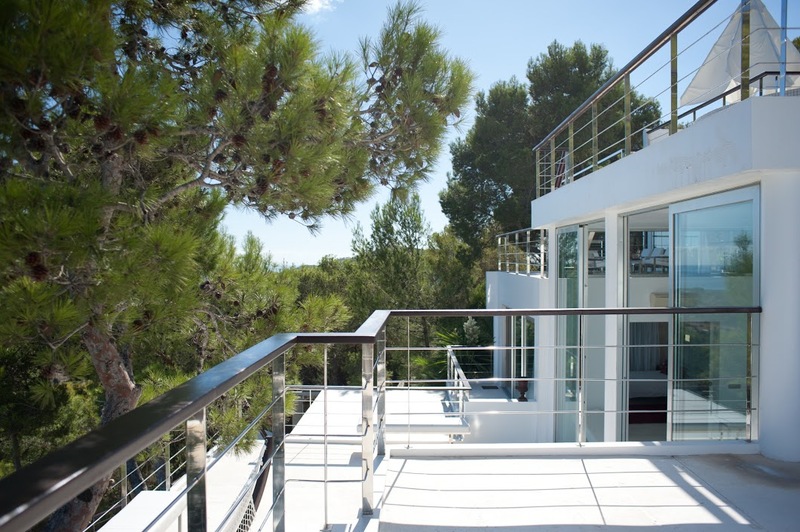 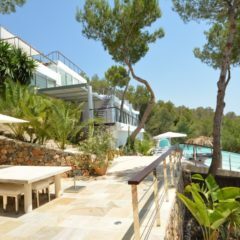 The villa is located 200 meters above sea level, in the midst of a 120,000 m2 pine forest. 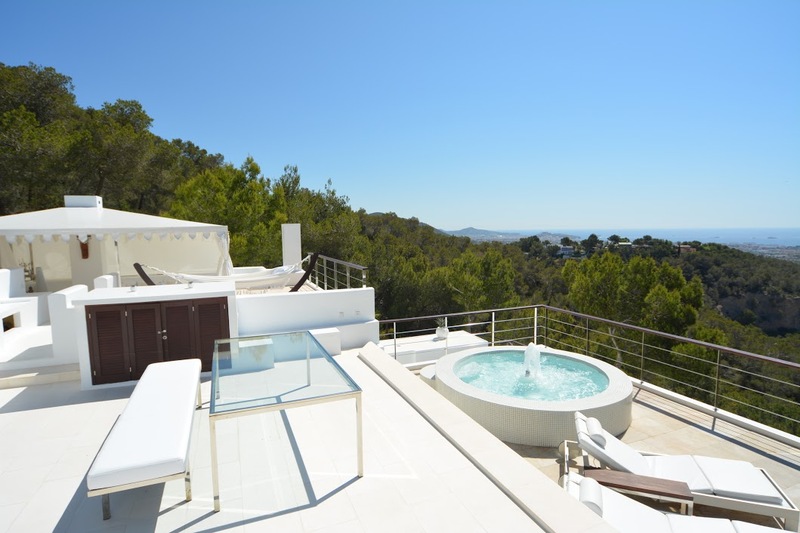 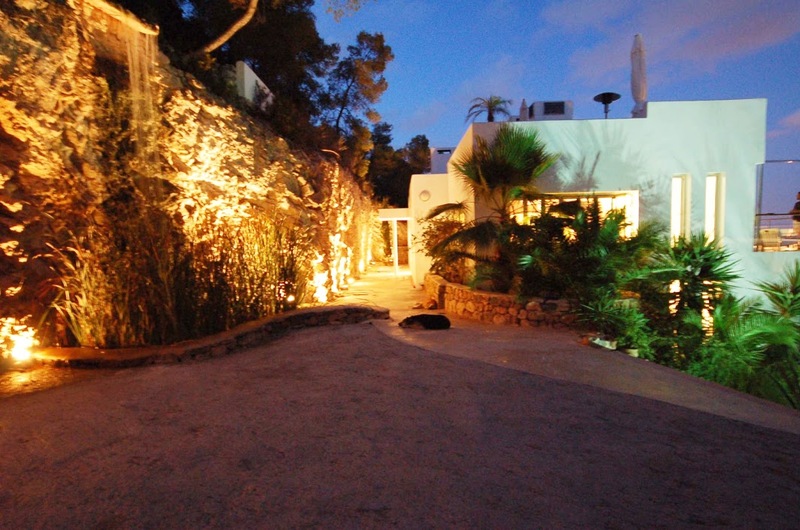 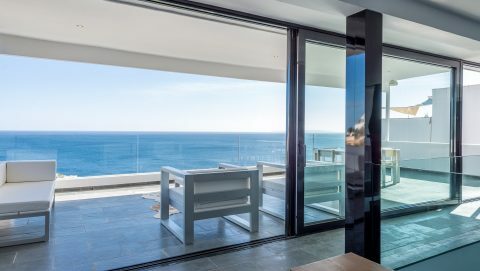 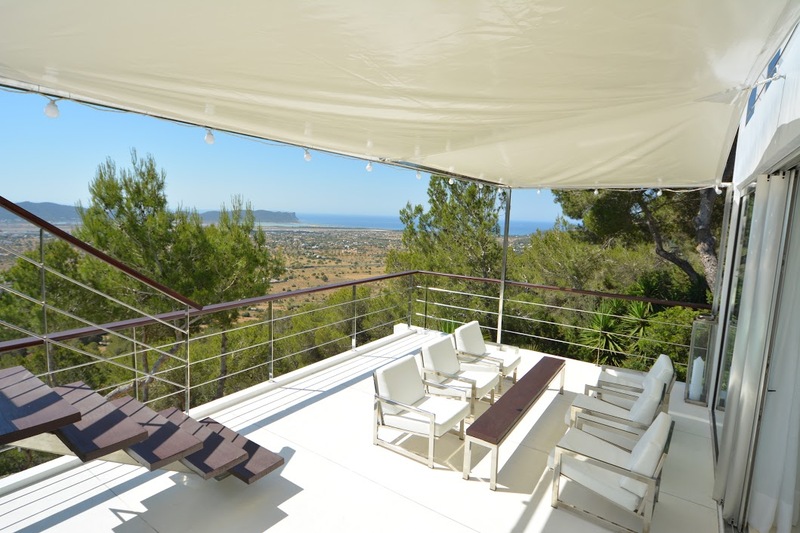 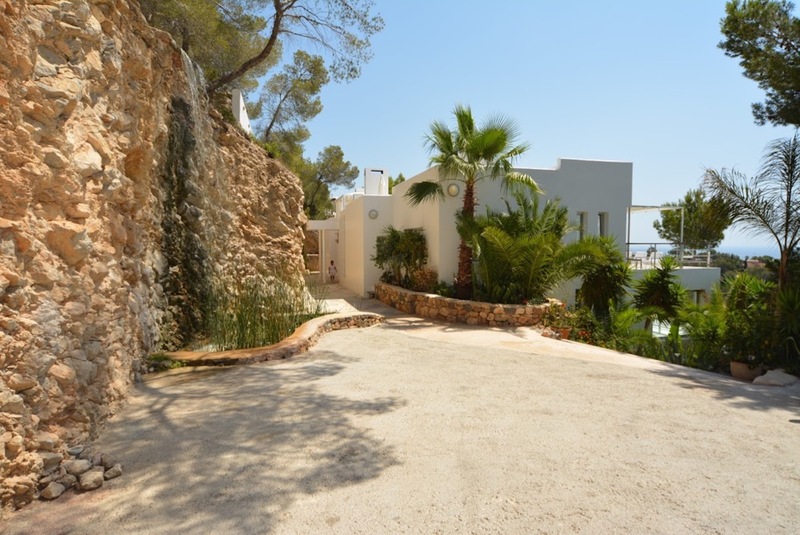 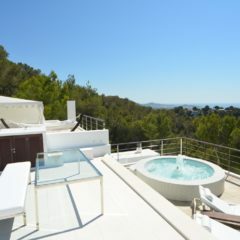 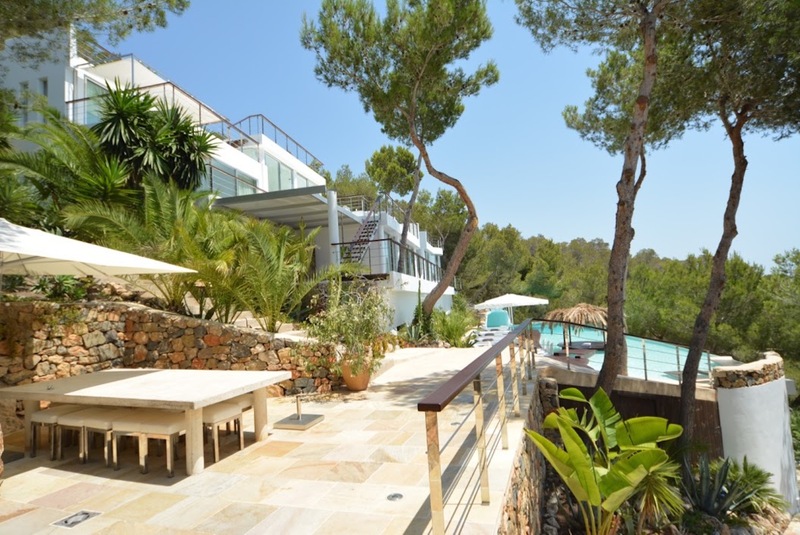 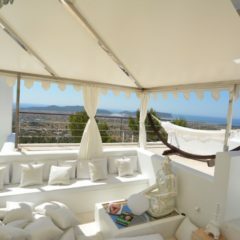 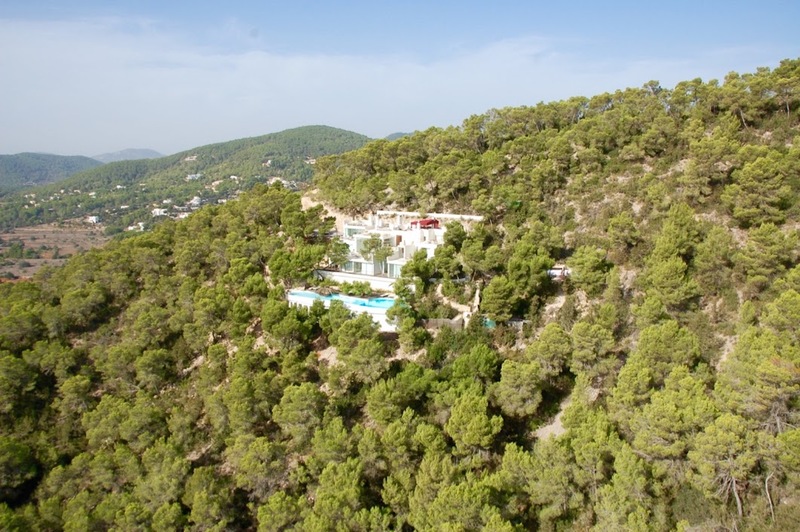 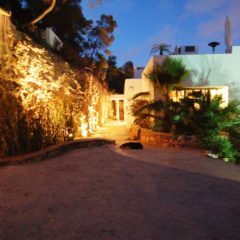 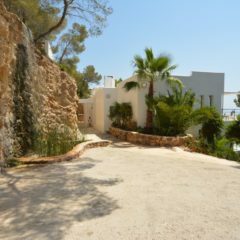 The property is just 6 kilometers away from Ibiza town on the way to San Josep. 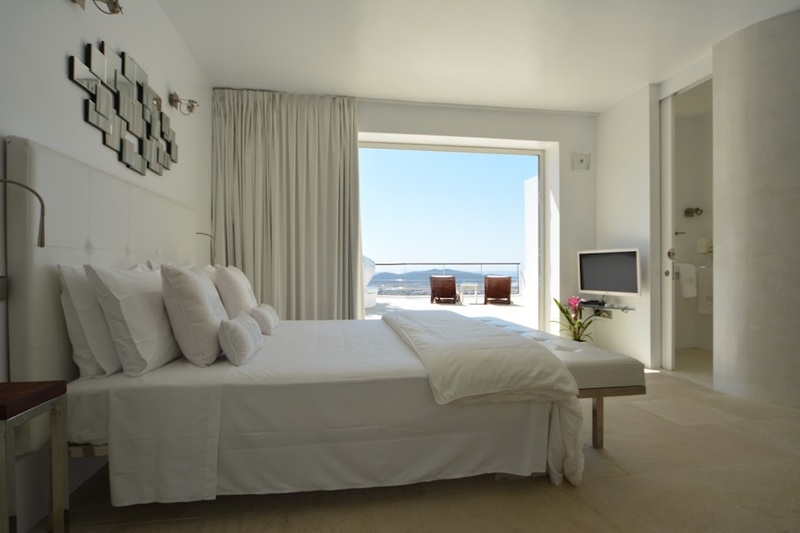 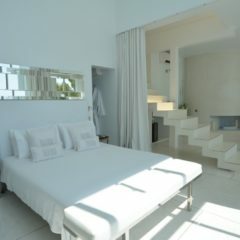 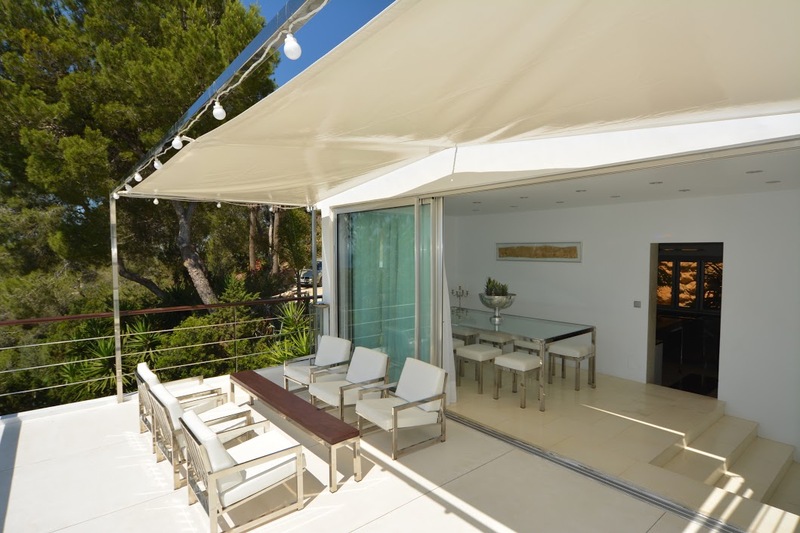 The villa is very spacious and tastefully decorated in a modern and minimalistic style. 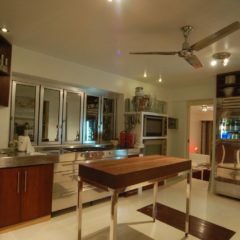 Most of the furniture, fixtures, lights etc. 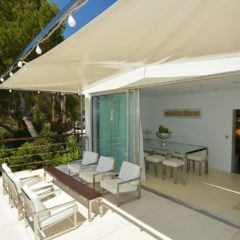 were designed specifically for the villa. 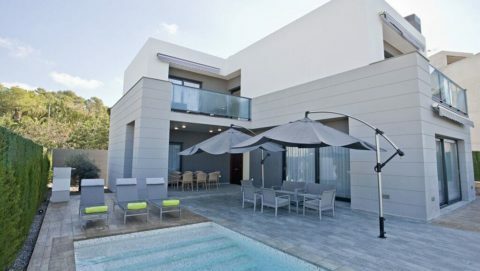 The house has 500 m2 of living space as well as 600 m2 of terraces and outdoor areas. 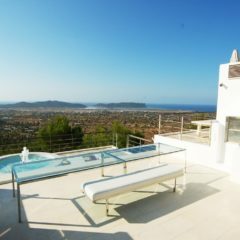 The spectacular 180º panorama view of Ibiza’s old town, the beaches of Salinas, Es Codolar and the island of Formentera are really unbelievable. 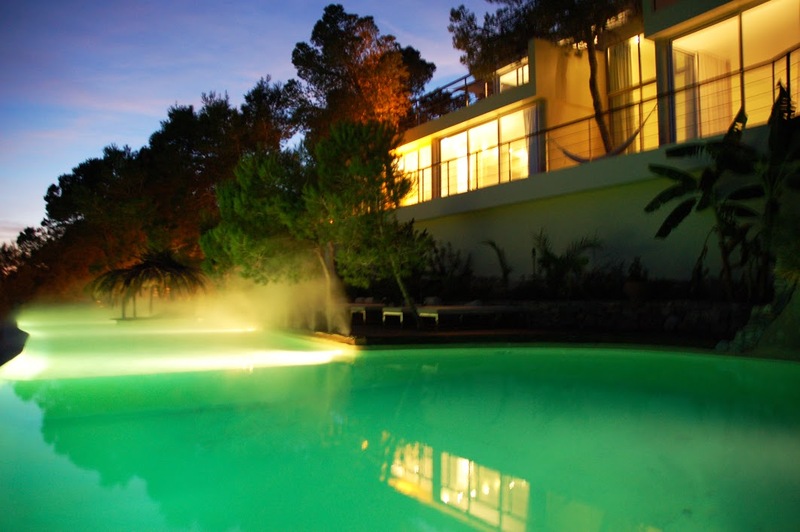 The 32 meter pool comes with waterfall, hidden cave, swimming cabana and underwater pool windows. 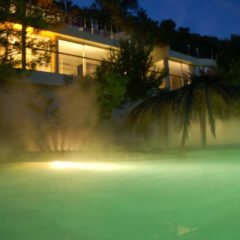 On the roof is a mini-pool for 12 people with hydromassage. 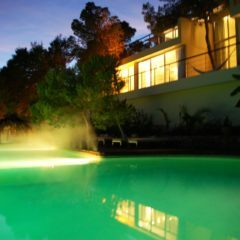 Next to the house is a natural pond with waterfall. 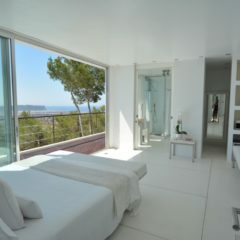 Two hydromassage jacuzzis, a fitness room and an infrared detoxification sauna complete this luxurious property. 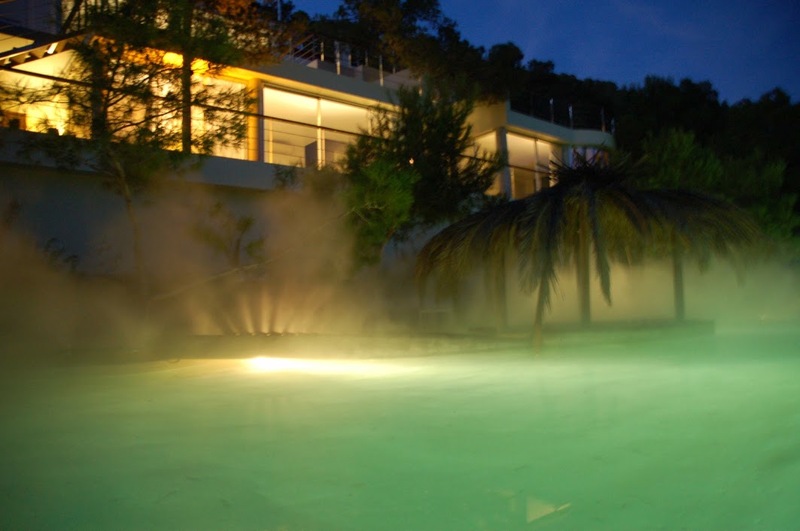 At the in-house pool bar you can refresh yourself with delicious drinks. 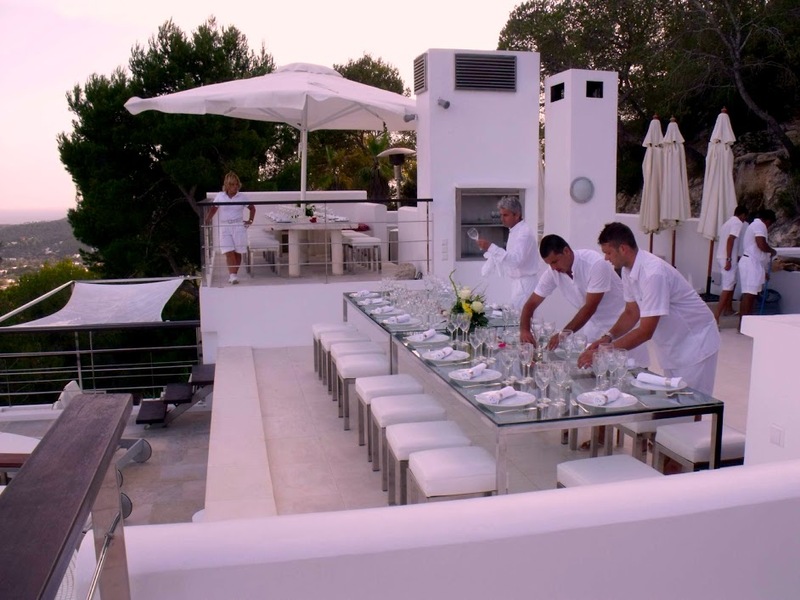 There is also a barbecue in the dining area. 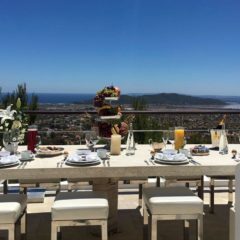 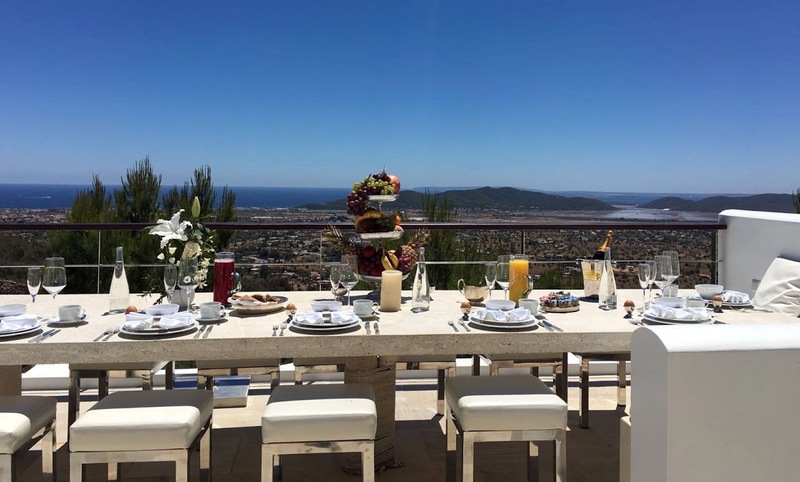 Whether it is breakfast in bed, brunch in the spectacular outdoor dining area on the roof, intimate dinner for two at the pool, barbecue for friends or a festive dinner on one of the 12 terraces: nothing is comparable to the stunning Villa Top of the World. 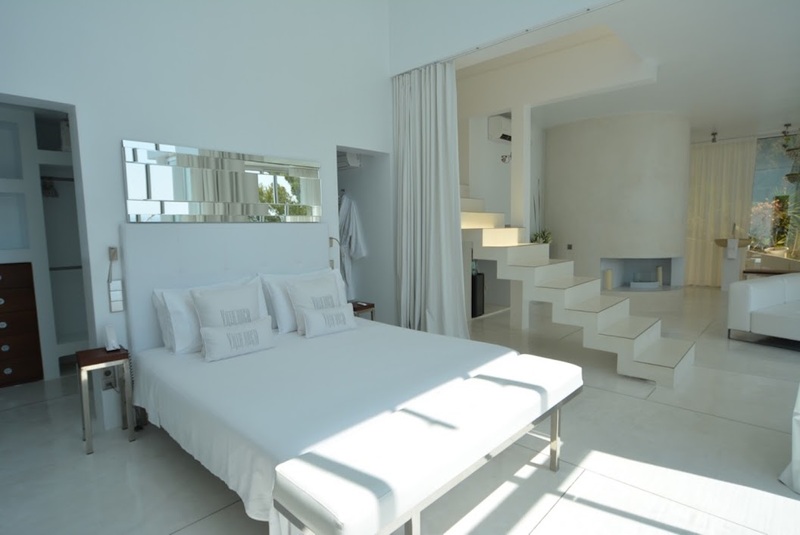 All the suites have a fantastic view and are equipped with DVD, sound system, digital flat screen satellite TV, air conditioning and mini-refrigerator. 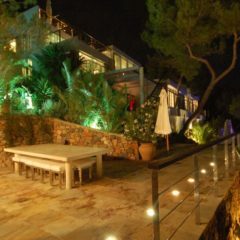 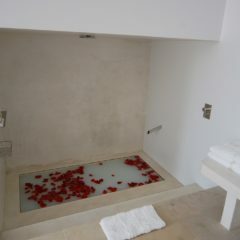 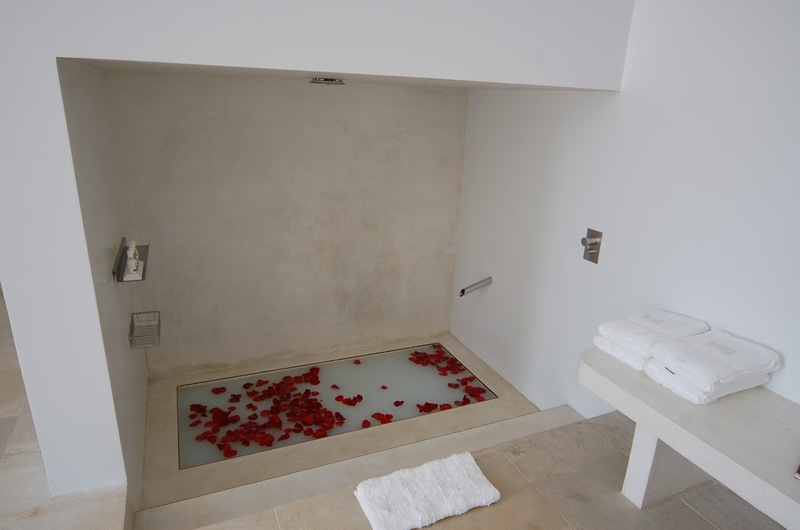 The house also has three guest bathrooms, four fireplaces, two barbecue areas and even a club with dance floor. 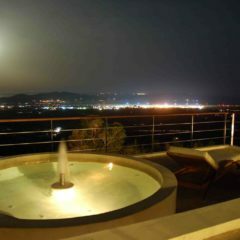 Do not hesitate and book the Villa Top of the World!